Welcome to your favorite neighborhood coffeehouse! Beyond the mundane of today's "big chain" coffee shops, Sertinos Coffee offers the highest standards in fresh brewed coffees, espressos, ice-blended drinks and premium loose-leaf teas. Our master artisan roaster insists on using only the finest quality organic and fair-trade coffee beans. Our customer experience is enhanced with a wide variety of fresh pastries, whole coffee bean selections, and unique coffee and tea merchandise served in a warm and inviting décor. Quality, genuineness, and excellence provide an authentic community coffeehouse experience unlike any other! 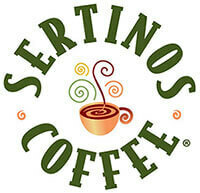 Sertinos Coffee Shops are all about hospitality, quality and variety. Our shops enjoy a warm and inviting upscale environment complete with Wi-Fi and a light "standards" entertainment audio environment. 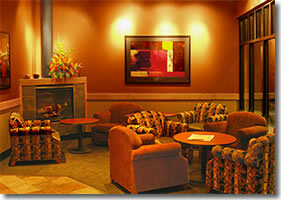 Sertinos Coffee Shops are a satisfying respite from the cares and concerns of everyday life. 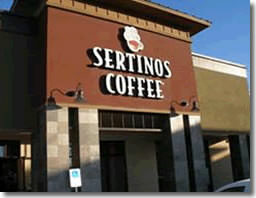 Our Company - Sertinos Coffee Shops are upscale coffee shops located in twelve states with expansion plans throughout the United States. Sertinos Coffee Shops are designed for a warm and relaxed environment catering to the specialty coffee and tea customer. Our stores are positioned to take advantage of the steady growth trend in specialty coffee and tea sales. Our Menu - At Sertinos Coffee Shops the quality of our coffee and tea drinks is paramount. We use the highest quality products available in generous portions. Our coffee beans are hand roasted daily in small batches and then shipped the same day to ensure freshness and deepest coffee flavors. We cut no corners, no steps are omitted and no ingredients are skimped. Our Environment - Sertinos Coffee Shops are welcoming and inviting a design that reflects the total upscale and hospitality experience; complete with appealing warm wood furniture, overstuffed chairs, inviting earth tones, interesting wall décor and a subtle entertaining audio environment. We have strategically designed our interiors to be as comfortable and inviting as possible to enhance our intimate Sertinos experience while facilitating superior customer service and maximizing sales. Our Mission for Franchise Owners - Now is the time to capitalize on the explosive growth of the specialty coffee and tea market with a Sertinos Coffee Shop. You will be indulging your customers with more than fresh, fine coffees, teas and chocolates. You are creating a community as rich and inviting as the neighborhood itself. It's a Sertinos Coffee Shop Experience. Whether or not you are experienced in the restaurant field, we take the time and care to get you acquainted with the tools and knowledge needed to thrive. In our initial and ongoing training programs you will learn what it takes to be in the hospitality business and what Sertinos is all about. We use our knowledge and experience to help make you an expert in the field. Please fill out the Request Information form for more information. Sertinos is a member of the SBA Franchise Registry which enables the SBA and its participating lenders to check a franchise's eligibility resulting in a reduction of paperwork, time and costs. Sertinos Coffee is currently accepting inquiries from the following states: Arizona, California, Colorado, Idaho, Montana, Nevada, New Mexico, Oregon, Texas, Utah, Washington.